Good news for the idli lovers, now they can enjoy idli recipe on their fasting day too. 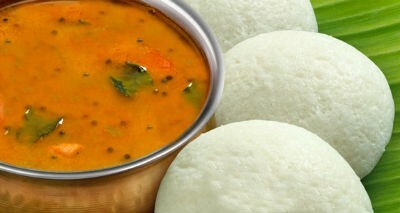 Check out the idli recipe and enjoy with your friends and family. 1) Take a bowl and clean sago and sanwa millet. 2) Drain the water and add curd, ginger-green chilli paste and salt. Mix well. Soak for 6 – 8 hours. 3) Grind and make a smooth batter without using water. Keep aside. 4) For stuffing, Take a pan and heat the oil. Add cumin seeds, green chilli-ginger paste and saute for few seconds. 5) Now, add potatoes, lemon juice, sugar and salt. Mix well and cook for 5 minutes on medium flame. Once done, cool and divide the mixture into 16 equal portions. 6) Take idli mould and put a tablespoon of idli batter. Spread evenly and put a teaspoon of potato stuffing. Then sprinkle peanut powder and cover the stuffing with another layer of idli batter. 7) Steam the idli until cooked properly. 1) In a mixer add coriander seeds, peanuts, 2 round red chillies, cinnamon and dry coconut and make a fine powder. 2) Take a deep vessel and boil water into it. Then add bottle guard, potatoes and yam. Cook for 8 to 10 minutes. Keep aside. 3) Once cool down, make a smooth puree out of it. 4) Take a non-stick pan and transfer the puree along with water (4 cups) and simmer for 7 – 8 minutes. 5) Add remaining bottle gourd and yam, salt, ground powder. Mix well and cook for 4 minutes. 6) In a small pan, heat the oil and add cumin seeds, 2 round red chillies and saute them for few seconds. 7) Pour the tempering into the sambar immediately and simmer for 3 minutes. 8) Add lemon juice and serve. The author is a blogger. He writes on various topics including food dishes. Idli recipes are his favourite and so he has written this article.